On 14 October, something special is happening - the ceremony for the 10th-anniversary Civil Service Diversity & Inclusion Awards. This is our chance to celebrate our diversity stars - some of the brightest examples of work by civil servants to champion difference and help the Civil Service achieve its ambition of being the most inclusive employer in the country. But, just like the stars themselves, it’s easy to take these vital people and what they do for granted. That’s why it’s so important to give them the recognition they deserve and raise awareness of all the activity across the Civil Service to make it a fairer place to work and reflect the diversity of the public we serve. Before we get stuck into this year’s excitement, let's take a minute to reflect on what the awards mean, and the calibre of the previous winners. With this in mind, we’ve asked several of last year’s winners to reflect on what the awards meant to them. 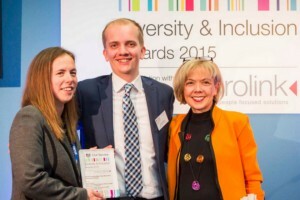 Kate and I were really honoured to receive the Civil Service Award for Championing LGB&T equality. We know that many Lesbian, Gay, Bisexual and Transgender civil servants encounter prejudice or discrimination in the workplace, with around a fifth saying they had been bullied in the last year. As Chair and Vice-Chair of the Civil Service Rainbow Alliance, we have worked hard to address this issue. This included producing a role models guide to showcase the talent of LGB&T civil servants; organising a Civil Service wide conference on LGB&T equality; and working with networks and individuals to develop local strategies to improve the Civil Service for LGB&T civil servants. We still have some way to go before the Civil Service is open and inclusive for all but we remain firmly committed to making that happen. Katie (right) with her co-winner Joanne Bradley (2nd right) and the then Permanent Secretary of HMRC, Lin Homer (2nd left), and Chief Executive of Microlink, Dr Nasser Siabi (left). With all the excellent work that goes on across the Civil service it was amazing to win our award. Being recognised for the hard work we put in was fantastic.The fact that these awards are represented by the whole of the civil service made it quite an honour. Good Luck to all the nominees involved this year! 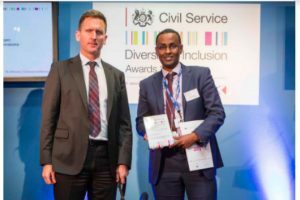 I am honoured and proud to have been nominated and awarded the 2015 Civil Service Diversity & Inclusion for the Championing Inclusion Category. 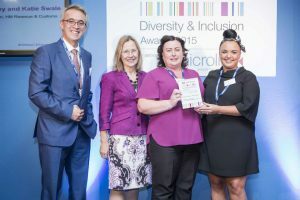 It’s rewarding to be in role where I can support and help vulnerable citizens to turn their lives around, and it’s great we have initiatives such as the Diversity & Inclusion Awards, which highlight the excellent work colleagues across the Civil Service are doing to champion diversity and inclusion. Since the 2015 awards I had the pleasure of sharing my experience and good practice with colleagues from across the business, and I think this is made possible because of the exposure the awards provides. May I wish my colleagues Alex Freegard and Jonathan Marshall and the FCO Staff Association FLAGG the best of luck! 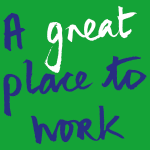 All have made a significant contribution to the shape of the organisation that we currently have in place.